Since AzhwAr who thought of attaining emperumAn in the proper way, found that the way was very nice, tells his heart mercifully that more than getting the experience born out of attaining emperumAn, the experience obtained in observing the activity for attaining him is in itself sufficient for him. nannenjE – Oh good heart! uRum kaNdAy – it is very apt, see for yourself. uRum kaNdAy – is apt, see for yourself. uRum kaNdAy – the word uRudhum has been shortened as uRum, throughout this verse. We can construe the meaning for this as taking the materials mentioned in the previous pAsuram (76) and attaining him. Alternatively, this could be construed as AzhwAr telling his heart to think of this (being explained in subsequent words) as a great act, instead of treating it similar to other benefits. uRum kaNdAy – for one who has been used to looking for lowly benefits, attaining the divine feet of emperumAn is the most apt act [AzhwAr tells his heart]. You know very well how we had suffered in lowly things from time immemorial. nannenjE – Oh heart, who is suitable for me! Alternatively, it can be taken as the heart which comes ahead of AzhwAr, with excitement, with lot of involvement in this matter. uththaman – emperumAn who considers the form, that he takes to protect us, as being for his own benefit. Even during the time when we shunned him, he came behind us. naRpAdham – His divine feet are superior to him to the same extent by which he is superior to us. pEyAzhwAr, in his mUnRAm thiruvandhAdhi 88 has mercifully stated “podhu ninRa ponnangazhal” (his divine, golden, beautiful feet are there for all of us in common). 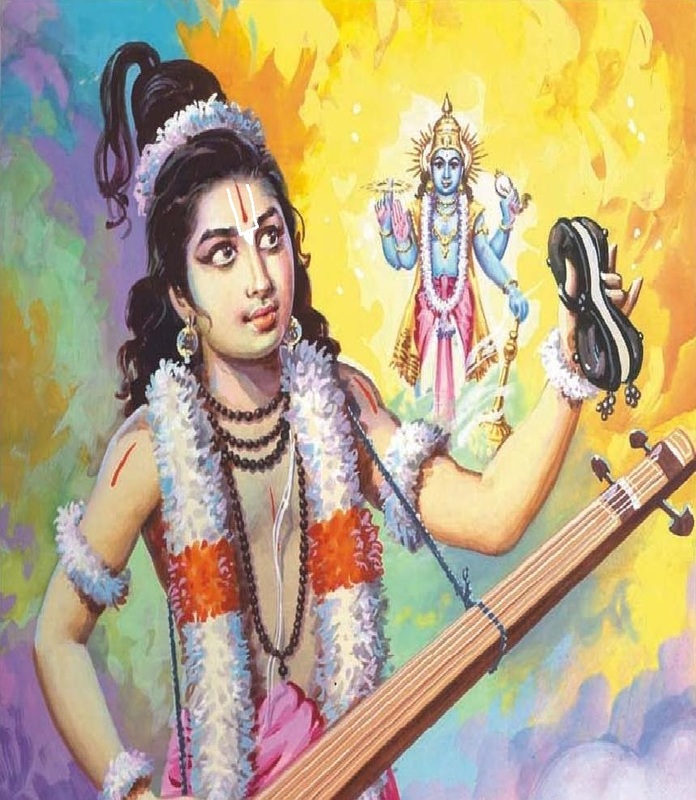 As prayed by kALiyan (the serpent which troubled people and cattle in yamunA nadhi during krishNa’s time in gOkulam), as mentioned in SrI vishNu purANam 5-7-10 “sOham thE dhEvadhEvESa nArchanAthau sthuthau na cha sAmarthyavAn krupAmAthra manOvruththi: prasIdha mE” (Oh Lord of dhEvas! I am not proficient in praising and worshipping you. For such a person as I am, only you have to shower mercy on me and grace me with your divine mind), the divine feet come on their own and rest on our heads. uththaman naRpAdham uRum kaNdAy oNkamalam thannAl – one can attain his divine feet with a beautiful lotus flower. Thus we do not have to carry out any great deed. There is no need to look for an aprAkrutha (extraordinary) flower which is apt for him. A normal lotus flower will do. uRum kaNdAy Eththip paNindhu avan pEr IraigyURu eppozhudhum sARRi uraiththal thavam – the penance of worshipping him and reciting his thousand divine names always is apt. This implies that more than attaining him, the activity undertaken to attain him is very sweet. The period spent in trying to attain purushArtham (the benefit) is sweeter than the period when we attain purushArtham. AzhwAr tells his heart to see for itself the benefit of reciting emperumAn’s divine names which is similar to carrying out penance. Would reciting his divine names be a penance? Since emperumAn considers this as penance, in empeurmAn’s opinion this will be taken as carrying out penance. We shall move on to the 78th pAsuram next. This entry was posted in iraNdAm thiruvandhAdhi, iyaRpA on January 22, 2018 by T N Krishnan.